82 The Iraq Experiences: Do Competencies Apply in the War Zone? Designed to teach you to think like an experienced clinician, this unique resource places as much value on process as it does on content. A case-based organization hones in on the must-know differential diagnoses of the common surgical presentations. Its convenient pocket-sized format enables you to review the material on the go, and online access via Student Consult enhances your study of the material and exponentially boosts your reference power. 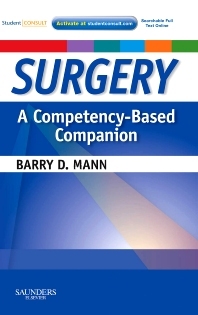 Provides high-yield core information essential to surgical rotations in a portable, pocket-sized format. Uses a color-coded system that places the core surgical information in a framework of the ACGME Core Competencies. Offers self-assessment activities throughout to promote retention and application of knowledge, including access on line to your own competency-based portfolio tools and competency-specific learning modules (Vertical Reads). Features ACGME Core Competencies enabling you to integrate evidence based medicine, continual self-assessment, and cognizance of interpersonal skills into your daily routine. Organizes the most common and must-know surgical signs/symptoms and disorders by presentation, making reference simple. Presents “Teaching Visuals”—an interactive teaching device designed to reinforce visual concepts. Equips you to perform a more in-depth review of surgical topics with “Clinical Entities” that are referenced to top surgical references. Includes access to Student Consult at www.studentconsult.com, where you'll find the complete text and illustrations of the book online, fully searchable • "Integration Links" to bonus content in other Student Consult titles • M&M form • Self-Assessment Competency Log • Professors Pearls that provide cases with questions and annotated answers • Vertical Reads • and much more!